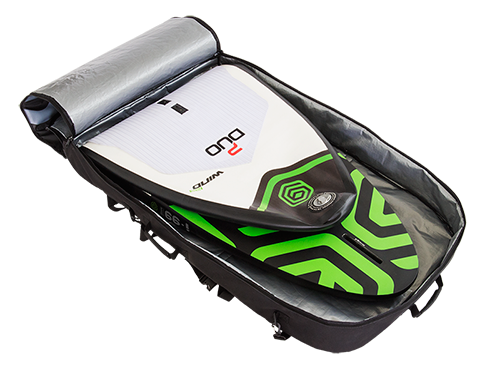 DUO Boards starts with a Patented idea of a folded out in to a bag boards concept that range from SUP, to WINDSURF and eventually SURBOARDS. Enjoy the limitless performance of DUO, provided by the high stiffness and shape stability of the hard tail, combined with minimized pack space needed thanks to the inflatable Mid-to-Nose section. The board has a reinforced deep tuttle box so it can take a foil!! Pumping up the board to max 15 PSI is faster and more comfortable compared to any full inflatable board. The air section also becomes much more rigid thanks to its shorter length. The performance of the hard tail, combined with the inflatable section provides ideal dual­-combination, with the hard tail allowing you to use fiberglass fins for greater rigidity and offering shape fidelity, that every performance board needs especially on the tail-rails, being the critical point and limit of shape of any inflatable board (boxy and soft). In this way we integrated an inflatable nose in to a full classic shape from the step area all the way down to the tail-end achieving performance and ease of use.